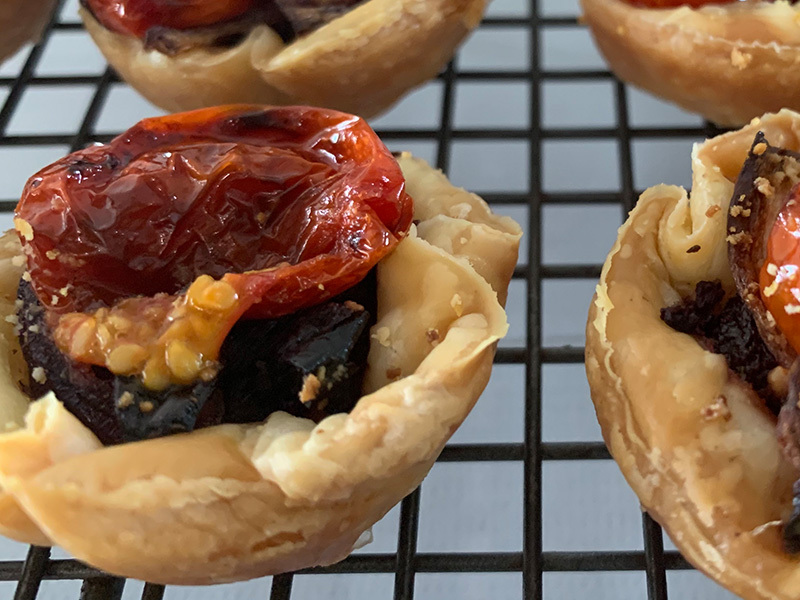 I was looking for some small, easy to make, savoury snacks recently and came across a recipe in a cookbook – Passion – for cherry tomato tarts. They are bite size, easy to make and full of flavour, thanks to the olive tapenade. 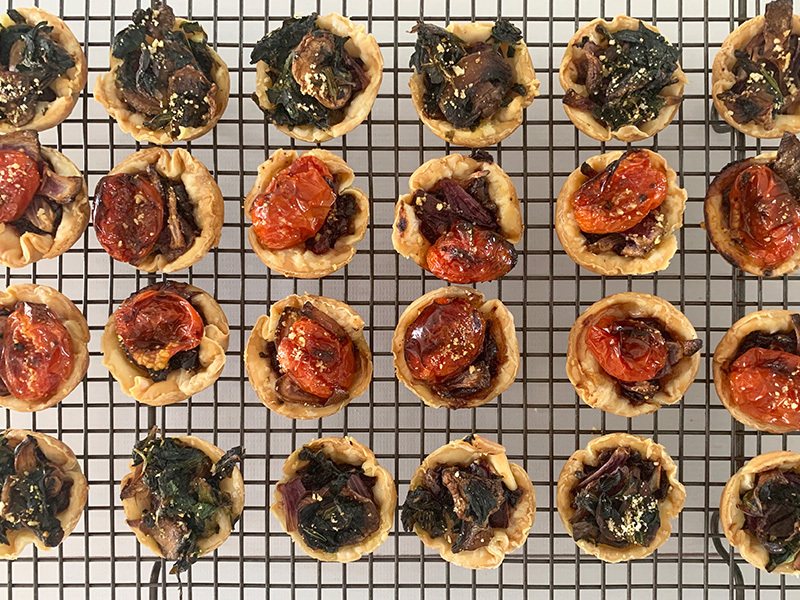 I made two varieties – cherry tomato tarts and mushroom with spinach tarts. You could make your own pastry or use ready-made pastry. 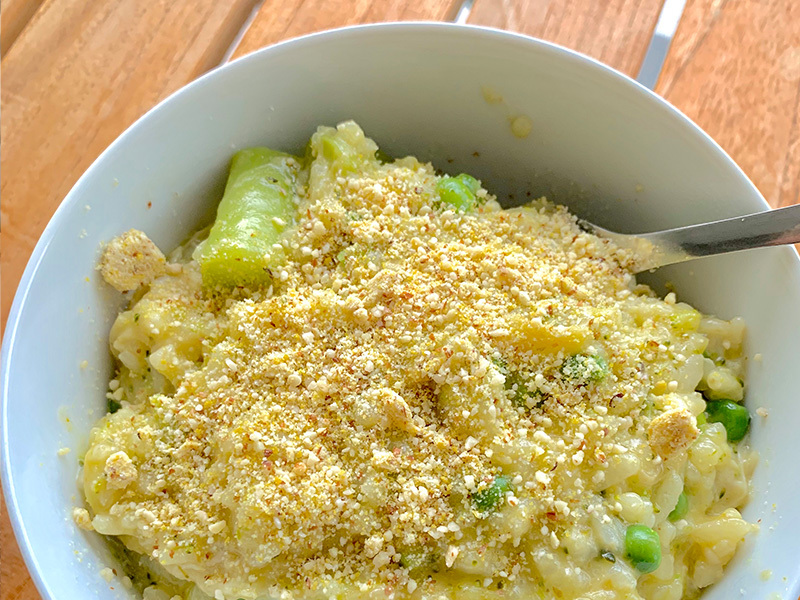 I used a ready made frozen pastry, the same one that I use when I make my chickpea sausage rolls which are in The Little ebook of Vegan Snacks. Puff pastry lasts for sometime in the freezer, if it’s in airtight wrapping and only takes 10-20 minutes to defrost (depending on where you live). The most difficult part of this recipe is making the olive tapenade, but once you’ve done that it’s just about assembling all the bits and popping them into the oven. Just make sure you pierce the pastry with a fork so that it doesn’t puff up and tip off the toppings. 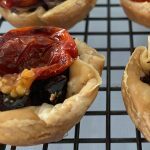 These tarts are a great finger food option and are just as tasty cold as hot. Be careful not to serve straight from the oven as tomatoes retain their heat, and you don’t want to burn your mouth! For a different topping, cook mushrooms and chopped spinach in a frypan until the spinach is wilted. 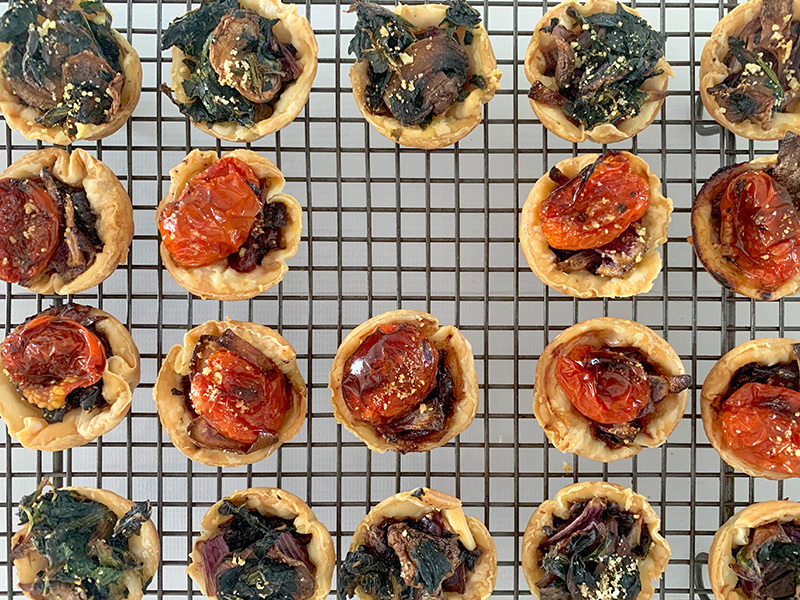 Bake as for the cherry tomato tarts. Place kalamata olives, capers, thyme, garlic, 2 tbsp olive oil and the basil leaves in a food processor and blend until fairly smooth. Lightly brush a 24 muffin tin with oil. Heat remaining oil in a frying pan and add cherry tomatoes, salt, pepper and thyme. Allow to cook until the tomato skins break and the tomatoes soften and deflate. Set aside to cool whilst preparing the pastry. Using a small glass press the top into the pastry to cut the rounds. 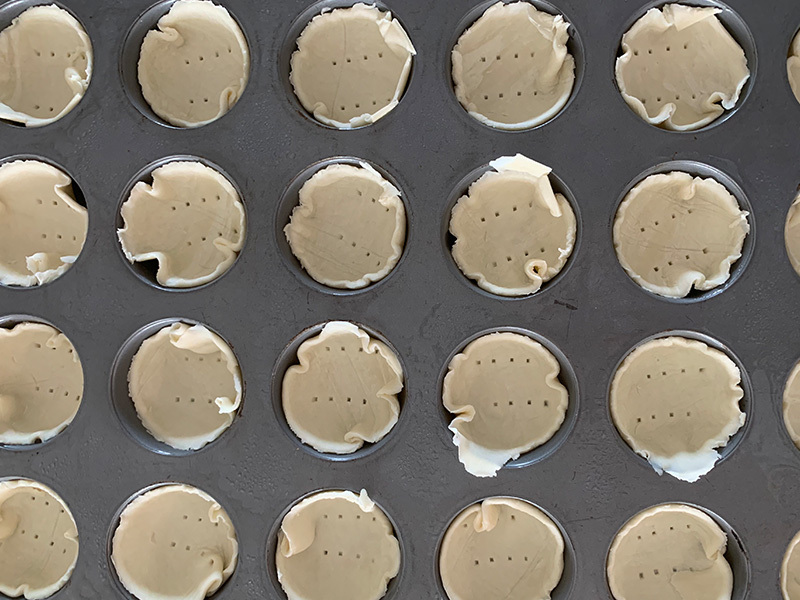 Place each round into the muffin tin and pierce with a fork to stop the toppings puffing off in the oven. 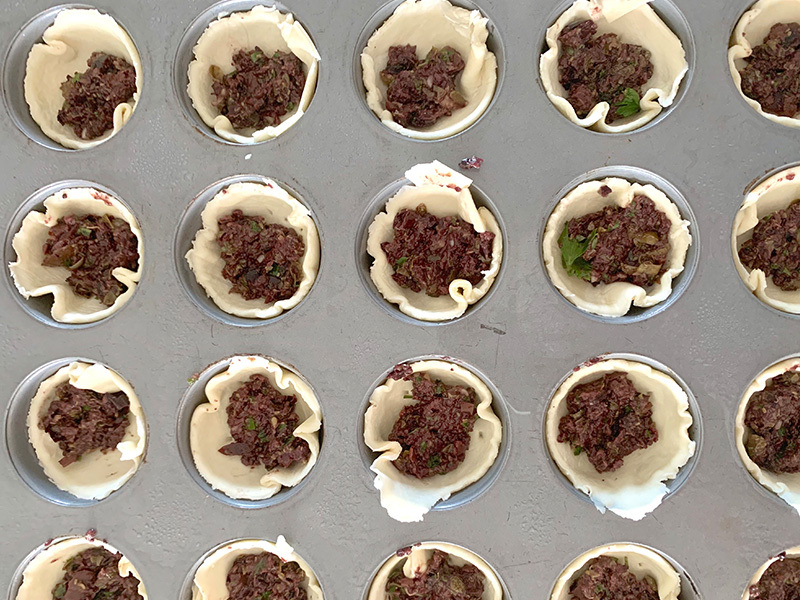 Place a teaspoon of olive tapenade into each pastry case. Top with a cooked cherry tomato. Place in a hot oven and cook for 15 – 20 minutes until the pastry edges are golden brown.